My memoir My Two Italies (Farrar, Straus and Giroux, 2014) is now available! You can PREORDER at Amazon, Barnes and Noble, FSG, and your local bookstore. 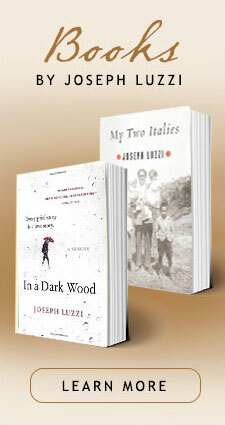 The child of Italian immigrants and an award-winning scholar of Italian literature, in My Two Italies Joseph Luzzi straddles these two perspectives to link his family’s dramatic story to Italy’s north-south divide, its quest for a unifying language, and its passion for art, food, and family. From his Calabrian father’s time as a military internee in Nazi Germany-where he had a love affair with a local Bavarian woman-to his adventures amid the Renaissance splendor of Florence, Luzzi creates a deeply personal portrait of Italy that leaps past facile clichés about Mafia madness and Tuscan sun therapy. With topics ranging from the pervasive force of Dante’s poetry to the meteoric rise of Silvio Berlusconi, Luzzi presents the Italians in all their glory and squalor, relating the problems that plague Italy today to the country’s ancient roots. He shares how his “two Italies”-the earthy southern Italian world of his immigrant childhood and the refined “northern” Italian realm of his professional life-join and clash in unexpected ways that continue to enchant the many millions who are either connected to Italy by ancestry or bound to it by love. Joseph Luzzi is a writer and professor of Italian at Bard College. The first child in his Calabrian family born in the U.S., he is the author of the forthcoming memoir, My Two Italies (Farrar, Straus and Giroux, July 2014), the dramatic story of his Italian family’s immigration and an insider’s look at the turbulence of life in Italy today, especially during the Berlusconi years. He is a frequent contributor of essays and reviews to publications including the New York Times, Los Angeles Times, Bookforum, the London Times Literary Supplement, and many others. His first book, Romantic Europe and the Ghost of Italy(Yale Univ. Press 2008), received the Scaglione Prize for Italian Studies from the Modern Language Association, and he is the author of A Cinema of Poetry: Aesthetics of the Italian Art Film (Johns Hopkins Univ. Press, 2014). His work has been translated into Italian and Portuguese, and he has lectured throughout the world on art, film, literature, and Italian culture.